This might be the best thank-you note ever! 1. Every part of it is hand written. 2. It mentioned very specific aspects of our interaction. It made me feel like Jay was very interested and engaged in our conversation. 4. It was timely. I spoke on Thurs. and got this on Monday. 5. It thanked me for my participation in and kind words of the YMCA, and encouraged me to continue to support them without any pressure. 6. MOST IMPORTANTLY- It included confetti!!! Now, yes it made a mess all over my desk, but that made me smile again…love, love, love this addition to the thank-you. I will speak about this letter for many years to come. 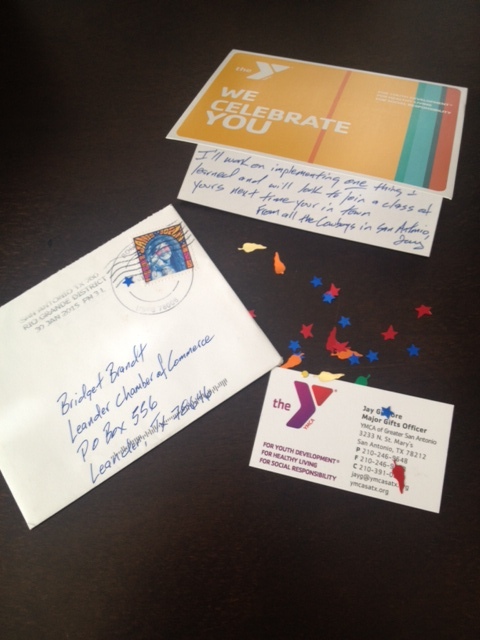 Take-away: This thank-you makes me want to work with and help the YMCA time and again. Jay, they should be very thankful they have you on their team. You truly get it!!! I wish every nonprofit treated all of their donors the way you treated me today.